Your wedding is one of the most important days of your life. The highlights of the ceremony and the reception will be meticulously photographed for you and your partner to look at when the sentimental urge strikes the two of you. For such a life-changing and recorded event, you ought to ensure you feel and look your very best. 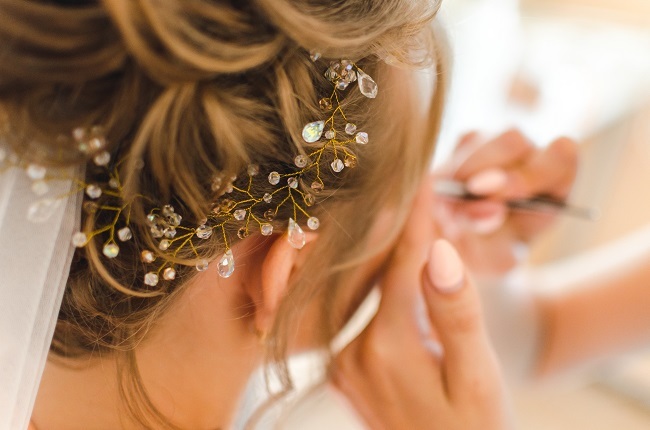 One way of being certain that you’ll be a lovely blushing bride on your big day is to book an appointment with a professional bridal make-up artist. There are a number of practical reasons to go with the route of a professional bridal make-up application. A wedding is a happy occasion, but it isn’t devoid of considerable stress on the bride and groom. Rushing to get ready before the ceremony will cause things to become more stressful. Hiring a make-up artist to do your make-up application will allow you to relax during the beauty process before the ceremony. Book your bridal make-up application appointment and hair appointment at the same location. This will allow the primping process more time efficient, as well as less stressful. A professional make-up artist is trained to know which make-up hues will complement you. The make-up artist you hire will do a thorough color analysis of your complexion and features. The artist will also take into account what kind of make-up colors you would prefer. They will work with you on creating the perfect color palette that will be acceptable to your preferences and complement your unique look. One of the main points of bridal make-up is that it must look exquisite in photos. A professional make-up artist knows all the tricks for photo make-up because they are trained and experienced with properly apply beauty looks. The proper application won’t be askew or shiny in your wedding photos. A professional make-up artist will utilize the best professional make-up brands for your bridal make-up application. Professional make-up products have better foundation coverage, color pay off, and are long-lasting. Professional brands will hold up for the entire wedding to keep you photo fresh. Be sure to book a bridal make-up application well in advance to your wedding. It’s recommended to book your beauty appointments one to three months prior to your big day. Contact Shelley’s Day Spa and Salon to set up a bridal make-up appointment or consultation.